NOW OPERATING IN DAYTON AND MIAMISBURG!! The Dayton QuadracycALE is pioneering an exciting way for craft beer fans to enjoy touring some of the finest craft breweries Dayton has to offer! 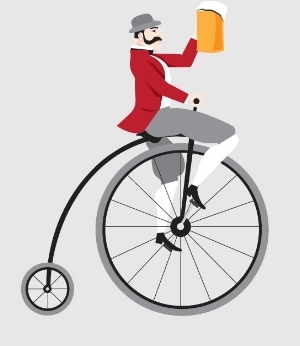 Locally owned and operated, the portable pub QuadracycALE is powered by alcohol and beer loving pedaling patrons. This is not your ordinary tour! Come check out the most unique way to see some of Dayton’s and Miamisburg's breweries and bars with discounted drink specials for our pedalers! Don't feel guilty for enjoying a glass of the finest craft brews around! The owners of the Dayton QuadracycALE wouldn't be able to sleep at night if they didn't do everything within their power to help you burn off some of those calories. Only requiring 8 pedaling patrons, this adventure will make you feel better about skipping leg day!